October National Day Holiday is five long days of vacation, or for some lucky devils, a whole week off. Last night we travelled to Qian Dao Hu (Thousand Island Lake) about 4 hours drive southwest of Shanghai for a few days' break. Everyone in China is on holidays, and every holiday destination is going to be packed to the rafters, but we hope by traveling far from Shanghai we might have a little bit of peace and quiet. We'll have to wait and see. I was hoping to show you the beauty of the lake, but when we arrive it is shrouded in darkness, so we head straight out to find some dinner. Lake fish is the local specialty, and every restaurant lining the main street has huge lakeside windows filled top to bottom with fish tanks. 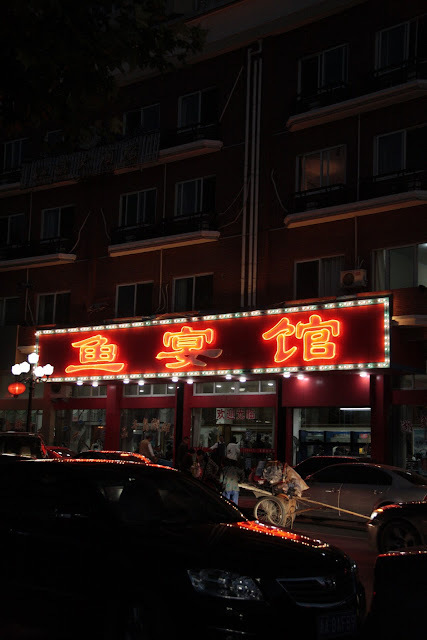 You could maybe see the lake if it weren't for the live fish and crustaceans obscuring your view, but for many Chinese people, the sight of food you're about to eat is the best view of all! The restaurant we eat at is chosen on the basis that a restaurant tout grabs us as we walk past, when we make the fatal error of a sideways glance into the inside of the restaurant. For her, that's all the encouragement she needs to haul us inside by the elbow and plonk at us a table. The waitress hurries over with an order pad, and hands me my worst nightmare - a picture-less menu typed all in Chinese. I could just randomly point and order, but I've had several disasters with this method in the past. Realising my inability to read, she leads me over to the best invention for the illiterate - the pictorial menu wall. 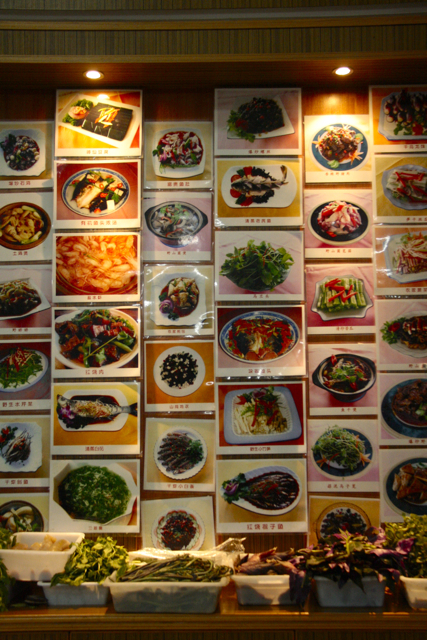 The menu wall looks like a kindergarten reading primer with large pictures of various dishes photographed on candy-coloured tablecloths. If you're still not sure, below the menu is a variety of baskets filled with vegetables and different kinds of shellfish and snails to choose from. I point, she points, we decide on a few dishes. I wish I could say that this was the best meal of river fish I'd ever eaten, but there are times when the menu wall is the best thing about a restaurant, no matter where in the world you are. No wonder the tout needed to be so persuasive! The food was at best, non-descript, and at worst, poorly cooked and flavourless. Never mind. There are plenty more restaurants to choose from over the next few days, and we're bound to have a great meal at one of them. And tomorrow, there's a lake and a thousand islands to explore.